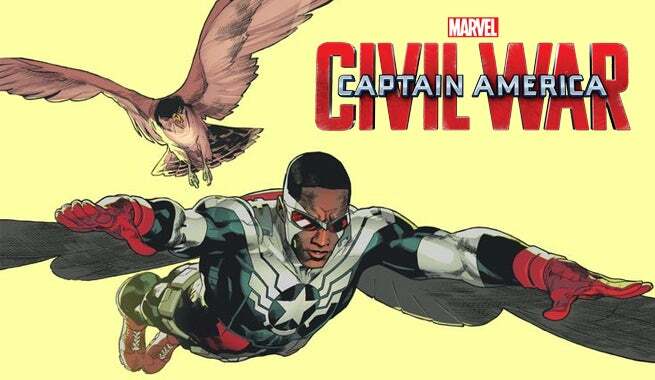 Sam Wilson and his trust “sidekick”, Red Wing, play heavy roles in Captain America: Civil War, as both Avengers and, more importantly, as support for Steve Rogers in his “Anti-Registration” campaign. Falcon, much like so many other characters in the Marvel Cinematic Universe, has changed drastically from his comic book origins in some respects, yet managing to maintain the essence of Sam’s character. Originally appearing in an issue of Captain America in 1969, Sam started as a street hustler, changed by the Red Skull with the use of the cosmic cube into a super powered hero to lie in wait as Cap’s friend, until the Skull would decide to turn friends into foes. Ultimately, the Stan Lee creation managed to break free of the Red Skull’s control and has been a Marvel hero ever since. Obviously, this wasn’t the story for the Marvel Cinematic Universe version of Sam Wilson. First introduced in Captain America: Winter Soldier, Falcon started as a member of the armed forces wielding an experimental weapon that granted him wings to float off the air. After meeting Cap during a run in Washington D.C., the two became fast friends and Falcon helped out with his adventures in the second Captain America movie, becoming a full-fledged Avenger in Age of Ultron. Now, Sam finds himself squarely on the side of Captain America and against the registration of heroes to be held accountable for their actions on the world stage. On his journey with Steve, he’ll have to come to terms with the return of Cap’s first best friend, Bucky Barnes the Winter Soldier. Making its first appearance to the big screen is Red Wing. Quite different from its comic book roots, Red Wing here is in fact a robot that Falcon employs to help him in the battle field while doing some Avengers’ missions here and there. The nifty little piece of technology has a plethora of hidden features that are definitely put on display in Civil War. Of course where this differs from the comics is that Red Wing is an actual bird of prey in the books. One of the lesser known abilities of Falcon is that he can actually communicate with birds and give them orders ala Aquaman with his underwater friends. I don’t think this is something we’re ever going to see in the films thanks to the more realistic approach the movies are taking, but who knows? So where is Falcon right now in the comics? He’s none other than the new Captain America! Yes, even though Steve has reclaimed the mantle of youth (He had gotten old, but then got better! ), Sam has decided to remain in his identity as the new Cap and holds onto the original shield while Rogers has a new variation to work with. Will Sam Wilson ever become Captain America in the Marvel Cinematic Universe? Totally possible even though he’d have to contend with the Winter Soldier for the crown. Regardless, if you’re looking for all the Falcon action you can handle, go see Captain America: Civil War.